Pilgrim Cleaners and the Houston Shoe Hospital have joined forces. 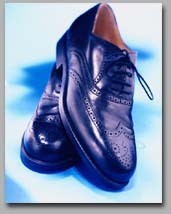 So, when you bring by your drycleaning, you can also drop off your shoes for quality repairs. Within two working days, a qualified "Shoe Doctor" will call you to confirm your order and get the specifics on what you need done. The Houston Shoe Hospital can shine, dye, recolor, stitch, patch, resole, or do just about anything needed to revitalize your shoes. * Shoe service is currently only available in our Houston locations.